The days when a kitchen backsplash was simply a continuation of whatever surface was on the countertop are long gone. And a simple painted wall as a backsplash? Forget it—today, the backsplash is regarded as a key design element in a kitchen, and a great deal of thought and planning go into the choice of materials and the design of the surface. 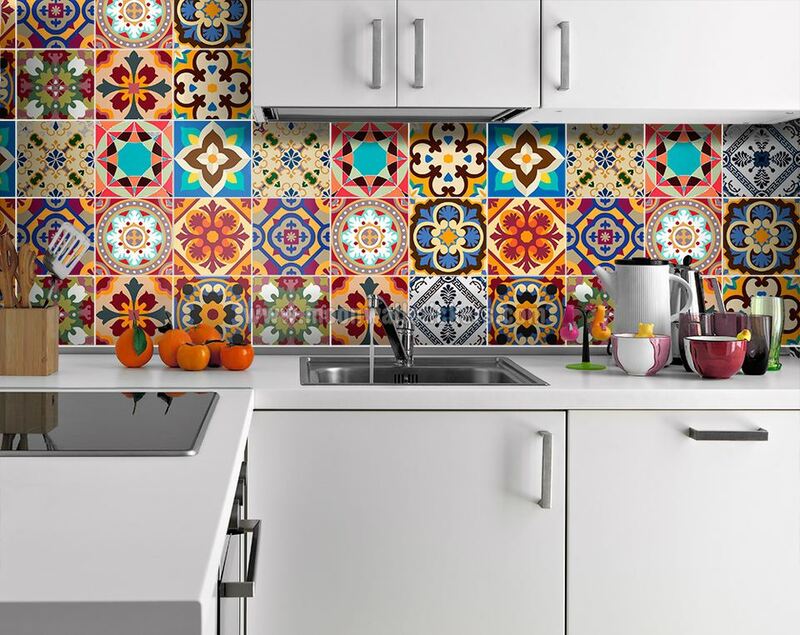 Traditional ceramic tile certainly still has its place—especially when it is stylishly planned with striking colors. But in today's kitchens, a large variety of non-traditional tiles are also possible, ranging from natural stones to glass and metal tiles. These 30 great ideas will inspire you to create your kitchen backsplash that makes a unique design statement. When you're talking kitchen backsplash ideas, it doesn't get much easier than this. You can introduce a nice crisp, clean, and traditional style to your kitchen for bargain prices with this great design. Run 4 x 4-inch white tiles in a diagonal layout along the back wall of your countertop. These 4 x 4 tiles are the true workhorse of the tile world, usable in bathrooms and floors as well as kitchens. But too many diagonal "four by" white tiles can be too much of a good thing. In this case, the installation begins with a level row of 4 x 4 tiles to border the countertop. Now, this is one kitchen backsplash idea that goes way beyond the basic concept of "splash." Backsplashes can run the entire length of the counter, not only just the area behind the sink. In this case, a rich Tuscan look is achieved with cream tiles offset by a tile centerpiece or medallion. This medallion was built from scratch by the tile-setters, highlighted by setting it within a field of tiles set diagonally to distinguish them from the surrounding tiles. Not interested in building your own tile medallion? You can also buy ready-made tile medallions that can be mortared into place, saving you the considerable work of creating such a complex tile design. Kitchen designers recommend that tile medallions should highlight some major feature of the kitchen—in this case, the stove. You're looking at tiles that are individually 1inch high and 2 inches wide, giving your kitchen backsplash more visual "length." They are also something of a conversation piece since subway tile layouts typically use much larger tiles. These 1 x 2-inch tiles come in 12-inch square sheets attached to a mesh backing for easy installation. This makes for an easy installation that looks like it took hours of work. To finish off the bottom and prevent water intrusion, this homeowner has installed a 3" marble border. Here's a bold idea: install 6-inch tiles in multiple colors. This homeowner has a contemporary IKEA kitchen cabinet design, so she chose to install purple and pink tiles in vertical columns. The actual Installation is just like installing any ceramic tiles—easier, in fact, because you are dealing with bigger tiles and thus have less grouting to contend with. The challenge here is in choosing the right colors and pleasingly arranging them. Some preliminary sketching is a good idea when you are thinking outside the box like this. This 4 x 4-inch real stone tile comes from Daltile, and it's called Copper Tumbled Slate. The "tumbled" part means that the edges and corners are rounded off. The surface of this tile has a rough, pitted appearance—very attractive for some kitchen styles. Part of the charm here is in the alcove-like setting of this backsplash. This is a constructed offset—a simple structure of dimensional lumber, drywall, and shelf molding purchased from a home improvement store. It can be built in a couple of weekends by an ambitious DIY homeowner. Even easier than the tile installations already described is this: a metal kitchen backsplash. Normally, stainless steel is not something a DIYer wants to handle—it's hard to cut, hard to fabricate. But this version is fabricated with ordinary metal ceiling tiles and applied with construction glue straight to the wall behind the counter. It's a super-clean installation technique that doesn't require messy thin-set mortar. American Tin Ceilings has an excellent installation guide, and they recommend patterns of 6 inches or less, which is a good idea with any kitchen backsplash. This is stone tile backsplash from Merola, featuring 4-inch square Indian slate tile. Slate or any other stone tile requires special cutting tools to shape—normally a wet saw—but is applied to the wall with the same kind of thin-set adhesives used with regular ceramic tiles. Slate is a fairly porous stone, though, and in a location such as a backsplash, it must be sealed against stains. Check with your tile source for recommendations on how to seal the stone. This bold design is from American Olean. The main feature of this backsplash is a pair of coordinated harlequin (diamond-shaped) tiles, called Mink and Smoky Sky. Each tile is 6 x 3 inches, installed vertically. The bottom border is Sylvan Accent Strip Rattan, 4 x 8 inches. Harlequin is a lively tile pattern that requires some forethought to avoid making it feel too busy. Muted colors like the ones featured here (as opposed to stark black and white) are a good way to go about that. In application, this design is applied like any other ceramic tile. The layout is the most critical task, along with a lot of cutting of tiles—such as the row of half tiles that begin the layout. From a distance, this kitchen backsplash looks like the regular ceramic tile of three different colors. But on closer examination, you can see that we're dealing with a glass tile backsplash made of 4 1/4-inch tile. The advantage? Glass tile catches the light like no other type, practically glowing under indirect lighting. If you're uncomfortable cutting glass tile, then have a tile installer do the job. Other than the cutting, though, it's a fairly straight-forward backsplash installation. This backsplash consists of 4-inch stone tiles in two rows along the bottom, with glass mosaic sheets filling in the field behind the range hood. The glass surface is American Olean Legacy Glass Green Blend 1 x 1-inch. One advantage of glass tiles is the ease with which grease and spaghetti sauce splatter can be cleaned away. Generally, mosaic tiles aren't a great choice to position right behind a stove, since they have many grout lines. So if you do this, make sure to keep the grout very well sealed to avoid discoloration. Using a dark grout can also help. We have seen some downright startling kitchen backsplash designs in this overview, but here's something that is sure to help you relax. Sandy Ridge: what could be more calming? This backsplash is simple to install. It's a row of 6 x 6-inch tiles adjoining the kitchen counter, with an accent strip of 4 x 12-inch tiles on top, then, another row of 6 x 6-inch tiles on top of that. That top row will need some cutting, but with a wet tile saw, it's a cinch. Even the ragged edges produced by a snap tile cutter should be (mostly) hidden because these edges will be tucked away against the bottom of the cabinets. This is a gray mosaic tile from Marazzi. Although it looks like natural stone, it is a through-body (not glazed) porcelain tile. Unlike stone, which requires sealing and may get stained when uses as a backsplash material, porcelain is ideal for backsplashes. This product is called Sahara Grigio; the sheets are 12 by 24 inches for quick installation. The sheets apply with standard thin-set adhesive like any tile product. This warm, friendly tile backsplash adds conviviality to any kitchen. A glazed porcelain stoneware, the Saguaro 6 by 6-inch tiles shown here are set at a diagonal, interspersed with ocotillo decorative tiles. Begin with the bottom border and work up. Although it is not a difficult installation, it will require a fair amount of cutting. Clear layout lines drawn on the wall will help keep your installation precise. You see this all over. It's popular. It's worldwide. But you cannot argue with success. From the Marazzi Olive Oxfords collection, this is a glass, mesh-mounted mosaic tile backsplash. Glass is the ideal backsplash material—it easily cleans to a shimmering surface, and the color never fades. Mosaic tiles make for perfect DIY installation, as the sheets install quickly and it is very easy to keep seams aligned. The sheets are easily cut to fit small areas or obstacles. Stone or glass? Why should you have to make a decision, when you can have both? Combined here are glass and stone materials fused to mosaic tile mesh sheets. These are 12 by 12-inch sheets from Marazzi. The style is known as called Crystal, and this color is called Ivory. This backsplash installed like any other mosaic tile sheets. Consult your tile supplier for advice on the proper adhesives and sealants. While most glass tiles don't require sealing, the presence of natural stone here means that some kind of sealing will be necessary. From Marazzi, this kitchen tile backsplash looks like wood, but it's a solid-body porcelain called Oak, from the Riflessi di Legno series of tiles with a wood-grain appearance. In addition to Oak, you will also find Ash, Cherry, Ebony, and Walnut. These are mosaic sheets and are installed traditionally. This is an example of wall-as-backsplash. The entire kitchen wall is laid with Florim USA's Moonstone—part of its Gems collection—above the counters and even behind the stove. These are fairly muted, neutral colors—it's called Smoky Quartz—but the tile is far from boring. This tile is made of glass, so even the most neutral colors sparkle and shimmer when the light hits the tile just right. When this kind of look is done with individual tiles, it's a labor-intensive installation that might be best left to a professional installer. DIYers may want to limit their attempts to products available in sheets. Want to shake up ordinary backsplash installations? Instead of mounting the tiles horizontally, flip them 90 degrees for vertical installation. Few installations are as striking as this look. These come from Florim USA's Iced Rocks Hampton Dunes Blend series. No problem. Just like horizontal tile installation, but vertical. Why should your backsplash be a mousy shrinking violet? How about a bold chrysanthemum instead? This backsplash tile from Ann Sacks positively refuses to be ignored: a Beau Monde glass mosaic in quartz, peridot, and jade. Peridot is a gem often called "the evening emerald by ancient Romans, who noticed that peridot's green color shone even more vividly in lamplight," according to our jewelry expert. This is an expensive product that you can't afford to make mistakes with. It's best to hire an installer if you are already spending thousands on the materials. Almost all tile installations use a repeated pattern, but for a truly gorgeous look, you might consider a continuous tile mosaic. In the true sense of mosaic, individual sheets of tile join in a prescribed order to form an overall large picture. This is Ann Sacks' Azure Birch mosaic. This is a tricky installation that should be attempted by only the most intrepid DIYer. It is a very expensive product that is best left to an installation professional. First, a 2 x 5-inch oval tile in alternating shades of green-blue tile. Second, a starburst tile called Gotham Oval Star (2 x 3.75-inch) that fits between those ovals. You can see how it works in the magnified inset shown at top right. Without this complementing star, you would have large spaces between the ovals that would otherwise need to be filled with grout. This kind of tile installation is very time-consuming for DIYers and professionals alike, so the payback is great if you can do the work yourself. The real challenge here is taking your time and being very precise with the layout. These large subway tiles are arranged in a straight-lay pattern rather than the standard staggered running-bond pattern usually used for subway tiles. This 4 x 12-inch glass subway-sized tile is from ModWalls from its Lush series of glass tile. This is a standard ceramic tile installation; the only challenge is keeping the lines straight. With large tiles like this, the layout is critical, because you want to avoid having to cut narrow strips of tile along the borders. One of the more unusual materials for backsplashes, recycled cork comes to the kitchen in the form of 12 x 12-inch sheets of individual 1-inch diameter "penny rounds," each about the size of a sliced-off wine cork. The recommended adhesives will be particular to the product, so check the manufacturer's recommendations carefully. Cork tiles do not come sealed, and it is critical that you do this immediately after installation. Once cork becomes wet or discolored, it is very hard to restore. Check out SJM's lush, rich lime-green color for these glossy tiles. Each piece is 1 x 3-inch, and each sheet is 1 square foot. Considering the high-style look, this small shop tile is relatively affordable. The band is called Accent Tile, which we'll call MBC-3527371. It, too, comes in 12-inch square sheets, and here has been cut up into bands. Each sheet gives you three bands, with only a small amount of waste. This very unusual effect uses small 1.5 x 0.75-inch mosaic tiles from a small upstate New York tile maker, with tiles mounted vertically and laid out in the shape of a sound wave. Such unique effects require an artistic eye to design the layout, then careful installation to match the design. The actual application, though, is done like any mosaic tile sheets. The blazing orange glass mosaic tile backsplash in this kitchen has one small, but significant, tweak: it's repeated as a band on the kitchen island. It's a brilliant touch, visually tying the backsplash together with the island. And it provides a fun, lively touch to an otherwise serious Shaker-cabinet island. This tile is Orange 1 x 6-inch glass from Susan Jablon. On wall surfaces, ceramic tile is best applied to a cement board backer panel, but on a wood cabinet, it can be applied directly to the wood with the same thin-set adhesives used for the wall tiles. Backsplash tiles are very often done with a high-gloss ceramic or porcelain tile, but there is another direction you can go: the look of rustic, tumbled stone, lively visual chaos that keeps things interesting. This look might be too busy for some, but the continuation of natural stone from the granite countertop into the slate backsplash makes a strong statement. The product here is 2 x 2-inch Butterscotch Tumbled Mosaic Slate from Bedrosian's. As mentioned earlier, natural stone backsplashes—especially those made with porous stone like slate—must be sealed periodically to keep them from staining. Installation is the same as for standard ceramic tile. In this example, a contrasting backsplash behind the stove range is made from a tumbled copper mosaic from Bedrosian-One. These areas are often markedly different because they perform different functions—catching ultra-messy splashes (bacon, gravy, spaghetti sauce, etc. )—and hence a different backsplash treatment is often appropriate. Metal tiles are usually installed with different adhesives than those used with ceramic or stone tiles. Check with the tile manufacturer for recommendations for installation.